North East based Vertu Motors is celebrating a double-win securing Dealer Group of the Year and Dealer of the Year for Bristol Street Motors Vauxhall Newcastle in the national, annual Motability Dealer Awards  which recognise outstanding customer service with the Motability Car Scheme. The Motability Dealer Awards programme is designed to reward best practice and ensure all Motability customers receive exemplary customer service across the nationwide car dealer network. The Awards are judged on how a dealer delivers the Scheme to customers, and is assessed by customer feedback and reviews of their Motability performance. The Motability Dealer Awards programme includes regional, quarterly prizes which were awarded during 2014, with all quarterly winners then automatically entered into the nominations for the annual award prizes. Bristol Street Motors Vauxhall Newcastle is celebrating after being announced as Motability Dealer of the Year, the second year in a row that the dealership has taken the top prize. Celebrating the Motability Dealer Award win, Robert Forrester, CEO of Vertu Motors, said: "We are incredibly proud to win this Motability Dealer Award. The Motability Scheme is renowned for its high standards and here at Vertu Motors we are honoured to be recognised for our dedication to working in partnership with the Scheme. We look forward to continuing our award-winning approach to Motability business and customer service across all our dealerships. 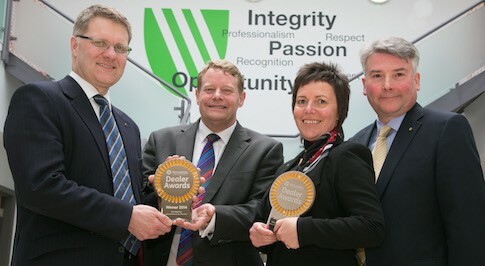 "We are also delighted that Bristol Street Motors Vauxhall Newcastle has won the Dealer of the Year. For our customers to recognise our efforts during one year are great, but to be recognised for a second year in a row underlines the outstanding customer service that our teams provide every single day." Peter Wilson, General Manager  Dealer Relations at Motability Operations, explains: "We are really pleased to be able to reward our outstanding dealers with another round of Motability Dealer Awards, recognising the great service they provided in 2014. The dealer network is the 'face' of the Motability Scheme and the Awards are a great way for us to thank them for providing consistently positive customer service, highlighting those who are doing it well and encouraging others to do the same. Congratulations to Vertu Motors who go above and beyond for our customers." Anyone who receives the Higher Rate Mobility Component of the Disability Living Allowance, the Enhanced Rate of the Mobility Component of Personal Independence Payment, War Pensioners' Mobility Supplement or Armed Forces Independence Payment can exchange their weekly payment to lease a new car through the Motability Scheme. Insurance, servicing, RAC breakdown assistance and replacement tyres are included in the cost of the lease.